When you arrive at the train station at Shin-Fuji, pop into the information centre. If it’s a cloudy day and you can’t see Mount Fuji properly, they will give you a postcard of the volcano as gift. 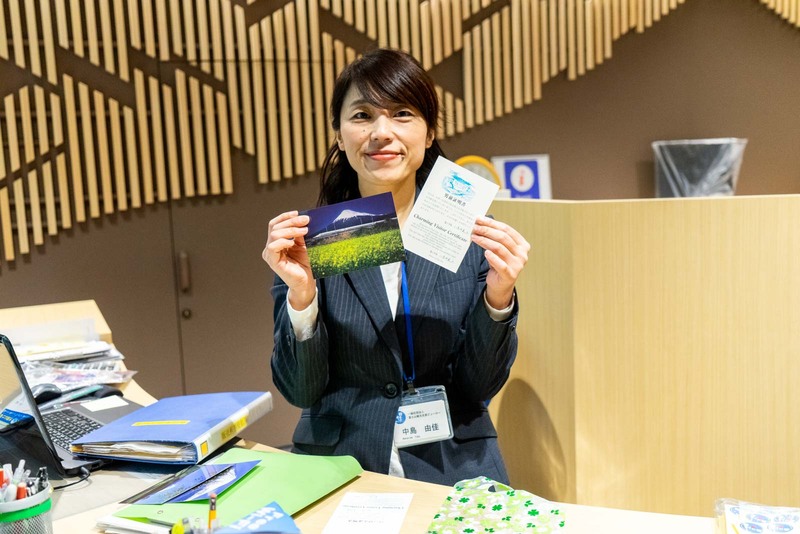 On the card, it explains that she (in Japan, it’s believed Mount Fuji is a female goddess) is shy or intimidated by your beauty, and that’s why she’s hiding. It’s a cute way to begin your stay here on the southern side of the mountain, around Fuji and Fujinomiya. The mountain is obviously the star attraction and, assuming there’s no cloud, it is never out of sight for long. 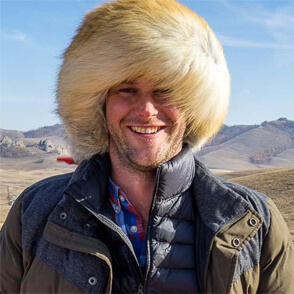 Everywhere you go in this region, it looms large above everything – both physically and culturally. 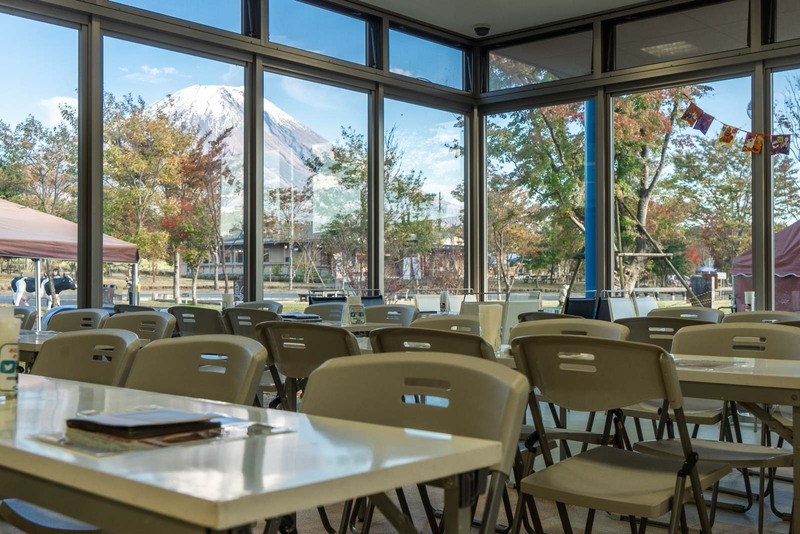 But even if you can’t see Mount Fuji on the day you arrive (and, on average, it is covered by cloud about 40 per cent of the year), there is still plenty do in this region to the south of the mountain. There are quite a few cities around the mountain that serve as bases for people wanting to explore Mt Fuji. But the twin cities of Fuji and Fujinomiya have a few advantages. 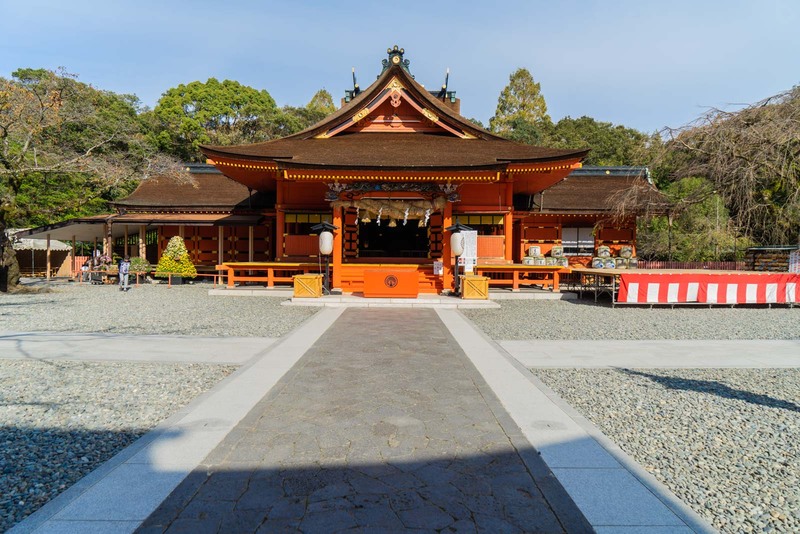 They are the closest to the summit, they are the only ones with direct shinkansen access (on the main line between Tokyo and Osaka), and they are also located on the most historic pilgrimage route (from Kyoto, rather than from Tokyo). It makes this a convenient stop for visitors who are travelling through the country – particularly those with a JR Rail Pass. And it offer some of the richest experiences for those looking for cultural history. After spending a few days in the region, I’ve been so impressed with what I’ve found. There’s a depth here that hasn’t been overly-commercialised by hordes of tour groups. It has national significance but local charm. But it’s not all obvious – sometimes you need to know where to look. 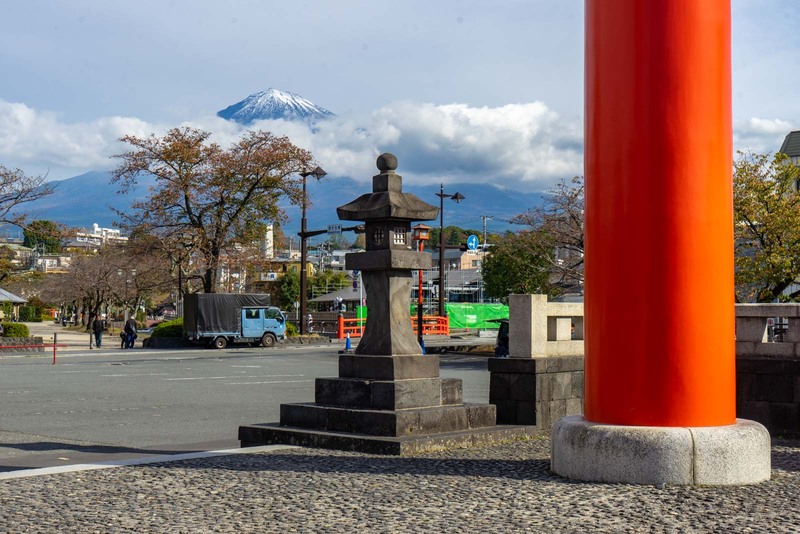 So, to help you with a visit, here is my list of things to do in Fuji City and Fujinomiya. Of course, I can’t put together a list of things do without starting with the star attraction – climbing Mt Fuji. There are several paths up the mountain that are accessible from different cities. However, the track from Fujinomiya is the shortest (although it’s also the steepest!). 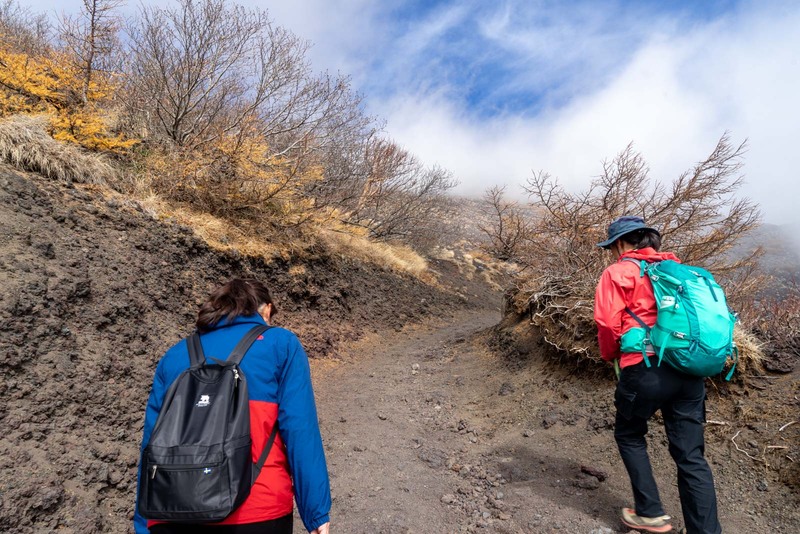 Most hikers start from the 5th station and the walk to the top takes about 5 hours. There are huts along the way to sleep or rest at night so you can be ready for the last little bit just in time for sunrise. The climbing season is short – from early July to early September – and you can get a shuttle bus to the 5th station during this period. 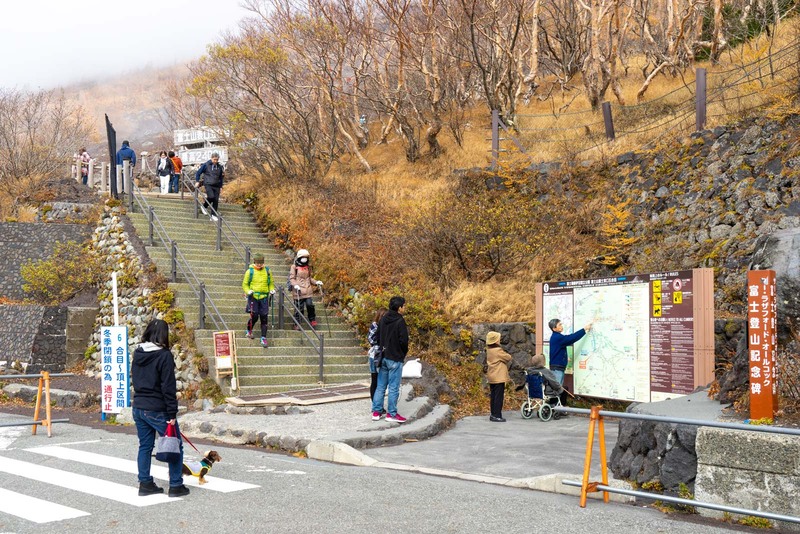 Outside of the climbing season, it is still worth going up to the 5th station because there are some trails you walk (although the path to the summit will be blocked). The shuttle bus doesn’t run all year, though. You can go with a local tour company to show you around and give you more information about the mountain. I recommend this Mt Fuji tour. 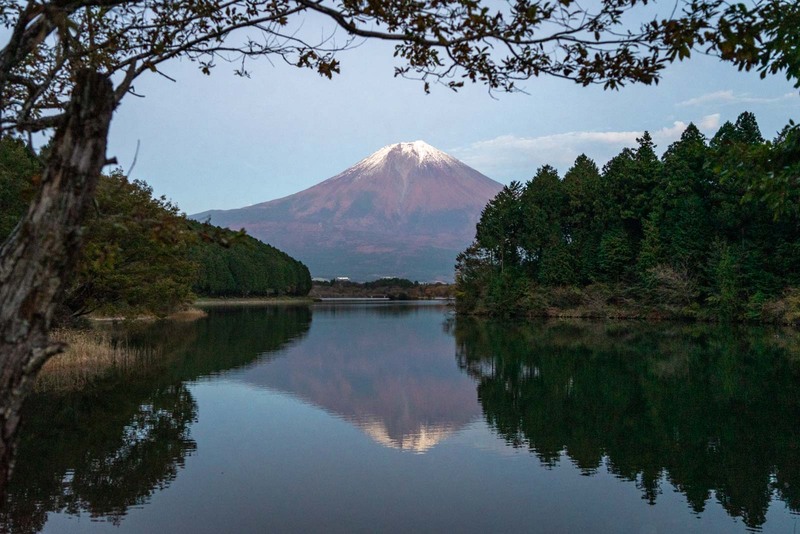 Mount Fuji has been named as a World Heritage Site – but it’s not just for the natural beauty. It’s the historical and religious significance that makes the volcano so important. For centuries, people in Japan have worshipped Mount Fuji, believing that it is a goddess or a place with links to the underworld where many gods live. Around the mountain are shrines and other sacred locations that have been used by pilgrims making the climb to the top for many generations. Seeing some of these sites offers a deeper understanding of the cultural context of Mt Fuji. Rather than list them again here, you can read my story about Mt Fuji’s World Heritage to find out more. In particular, I would suggest seeing Fujisan Hongu Sengen Taisha Shrine, Yamamiya Sengen-jinja Shrine, and Shiraito Falls. 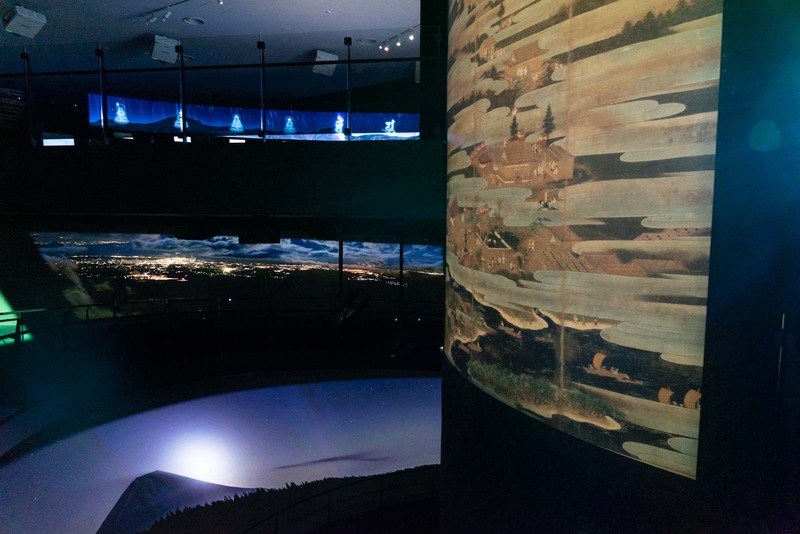 Another way to learn about the history of the mountain is at the new Mt Fuji World Heritage Centre, which opened at the end of 2017. 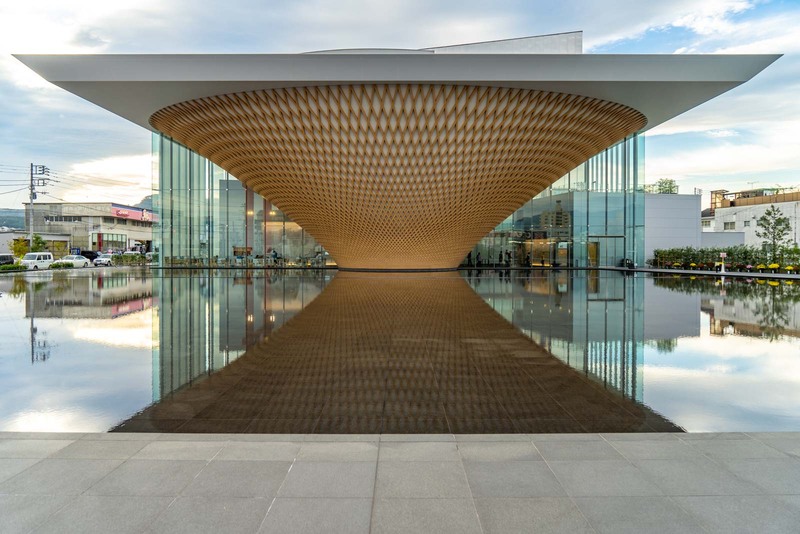 This incredible new building is an architectural marvel that creates a reflection the shape of Mt Fuji in the pool outside. Inside, you gradually rise up the levels in a process that represents climbing Mt Fuji. along the way is lots of information about the geology, history, spirituality and artistic inspiration of this famous Japanese volcano. This really is a fantastic museum and interpretation centre and is not to be missed on a visit to the Fuji region. Make sure you find time to watch the free short movie in the centre’s theatre. If you’re coming by Shinkansen, you’ll arrive in Fuji city. There aren’t a lot of famous sights here but it’s a nice Japanese city. 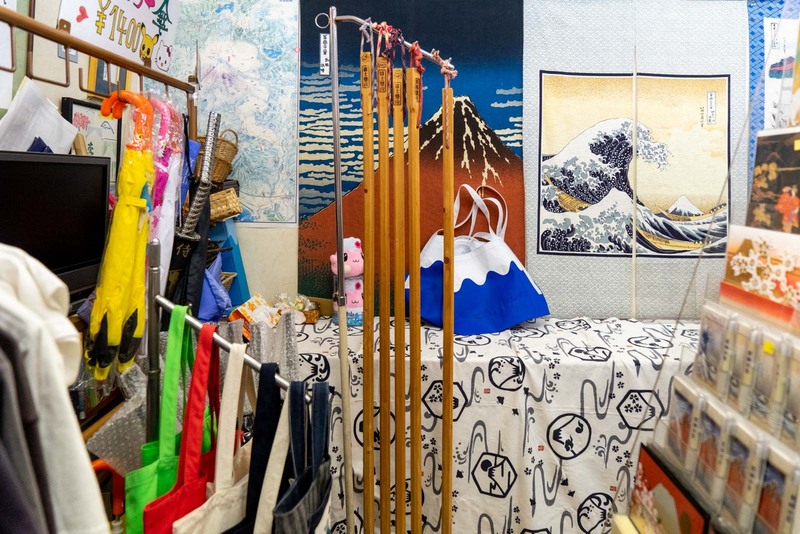 One of the most interesting parts is Yoshiwara shopping street, which is a historical commercial district that now has a range of different shops that may be of interest. Look out for the fruit jellies, which are a local specialty, and the stores that have interesting authentic souvenirs of Mount Fuji. This is not an area full of tourists so you’ll be able to find some authentic local shopping here. 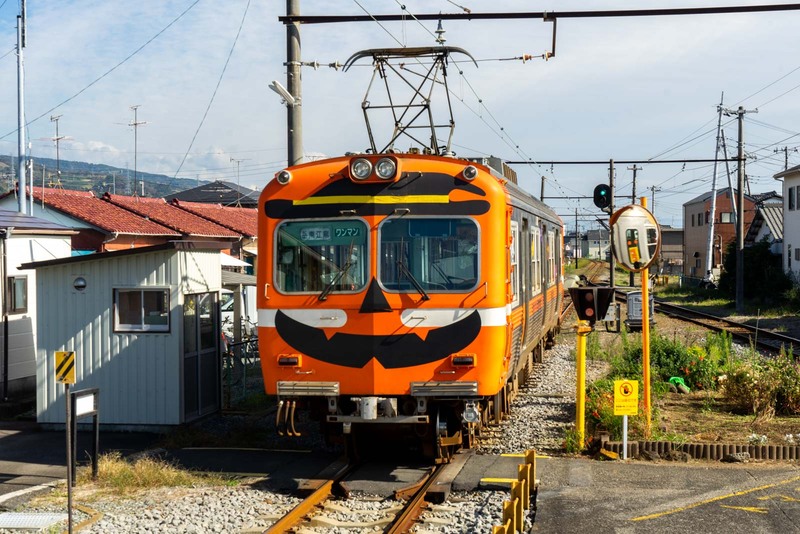 Speaking of local experiences, when you’re in Yoshiwara, you might like to take a quick ride on the Gakunan Railway Line. This electric train line was opened in 1936 and is quite famous. Although it’s just now just a normal local line, it offers great views of Mt Fuji for most of the route. It’s a fun way to see the mountain from different angles and also experience some Japanese life. You can jump on at Yoshiwara station and go for as many stops as you like and then come back again. You’ll also see residential and industrial parts of Fuji. Yoshiwara shopping street is also one of the best places to try an unusual local delicacy called Tsuke-Napori. 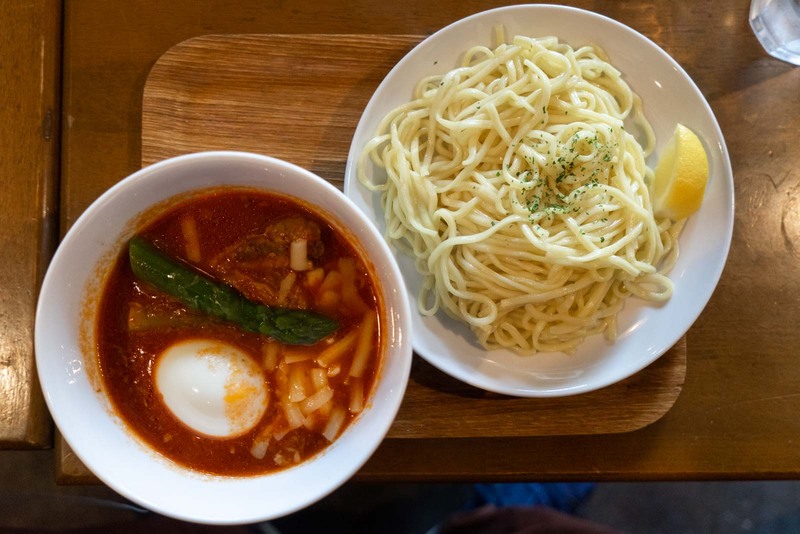 It’s a combination of the word ‘tsukemen’ – which is a dish where noodles are dipped into the broth – and ‘neapolitan’, like the Italian sauce. So Tsuke-Napori is a bowl of ramen noodles that you dip into a bowl of Italian-style tomato sauce. It’s strange… but really tasty. And it’s a good example of one of things I love about Japan – that you can have a dish like this that’s not just local to a city, but to just a small area like Yoshiwara. I would recommend trying it at Sofarii Cafe but you’ll find it other places as well. 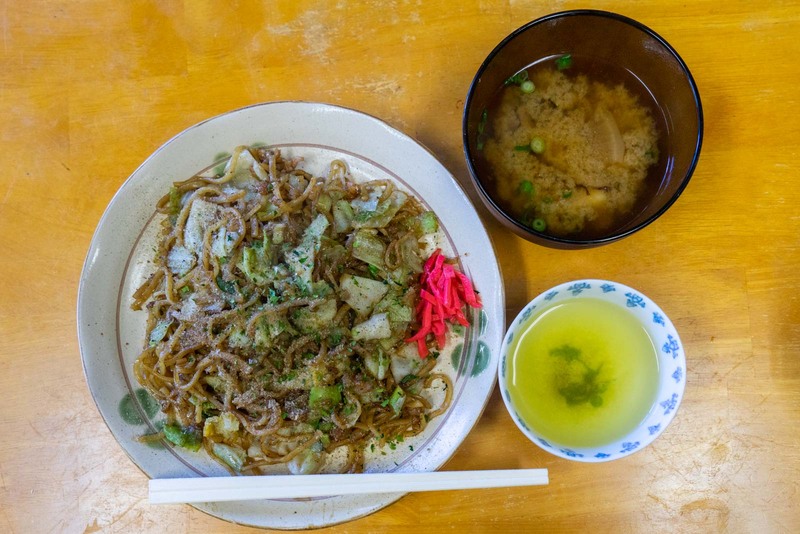 In neighbouring Fujinomiya, the signature dish is the good old yakisoba. Although you can find this all across Japan, the version you get here is special. The Fujinomiya yakisoba has regularly won recognition as the best in Japan. It gets its award-winning taste from the local cabbages that are used, the smaller-than-usual amount of water, and a unique sauce. There are quite a lot of restaurants in Fujinomiya that serve the special yakisoba so look out for one of them. 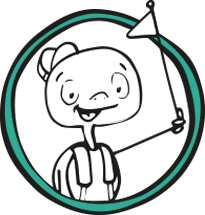 You may even be able to find a map that shows you where the best ones are. If you are interested in discovering more about the local food scene, I would recommend this great tour. A little drive out of town, there’s actually a place that is dedicated to local food and drink. The Asagiri Food Park is a collection of regional producers that make and sell their specialties here in the one place. You can go to the dairy and see them work through large windows and then try some of their famous ice cream. 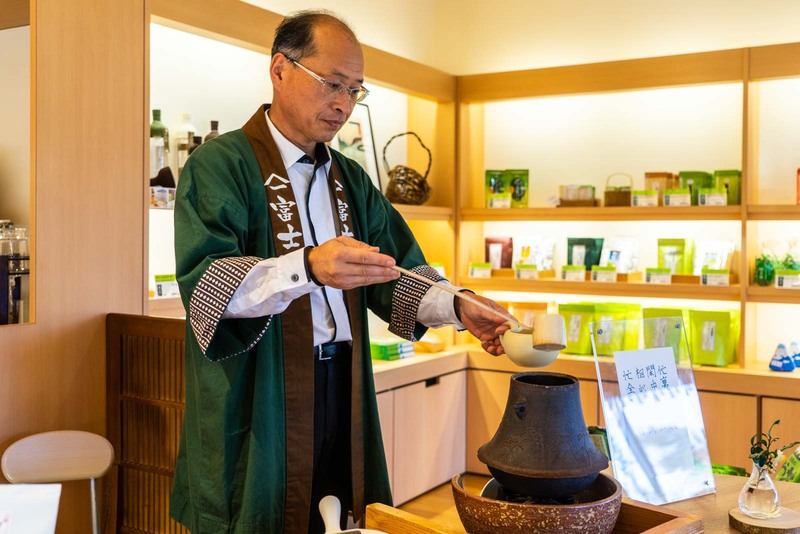 There is a tea shop where you can try some of the local matcha. Plus there is a sweets shop, a fantastic shop where they make sweet potato chips with different flavours, and even a relatively large sake brewery. As if there weren’t enough natural wonders here, after Mt Fuji itself and Shiraito Falls, the next most popular spot of Lake Tanuki. Although, technically it’s not natural because this large lake was created in 1935 by damming a local river. Still, it is a beautiful spot for outdoor activities and is popular for fishing, boating and hiking. There are also camp spots here with excellent facilities, so you could even stay the night if you’re prepared. But one of the main reasons tourists come here is for the postcard photo views of Mt Fuji with Lake Tanuki in the foreground. It’s stunning any time of the day but is particularly special at sunset. 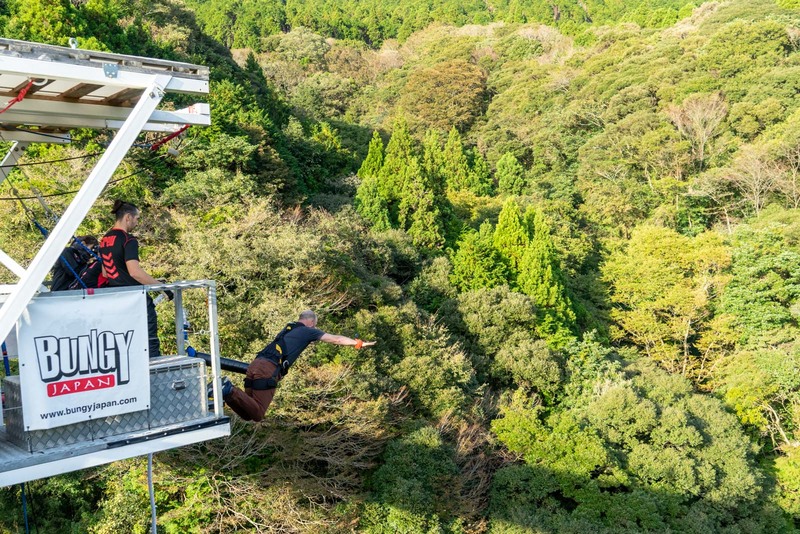 OK, you probably didn’t expect this, but it turns out you can go bungee jumping near Fuji City! I had never been before but thought this might be the time to try it. The jump is 54 metres high and is from a bridge over the Suzu Valley. In one direction you can see waterfalls and in the other you can see Fuji City – so it’s very scenic. But I wasn’t thinking about any of that as I stood on the edge about to jump. It was really scary – as you might expect – but also a lot of fun. I was really glad I gave it a try and I’m sure Japan is one of the safest countries in the world to do something like this. Want to hear a grown man scream?? Well, that’s what you’ll get with this video of my first ever bungee jump!! I don’t understand why people can’t just enjoy the view from this bridge near Fuji City in Japan. Apparently some enjoy throwing themselves off it too! For something a bit different in Japan, I would highly recommend a bungee jump. Bungy Japan is also the closest one to Tokyo, which is another good reason to pop down to this part of the country. And, finally, if you are still looking for something to do once the sun has gone down, perhaps you want to go to a unique viewpoint. 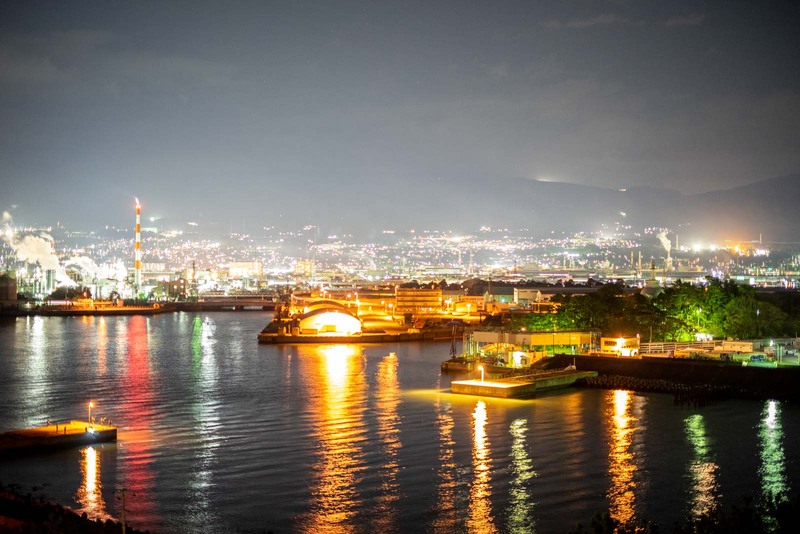 It may sounds odd, but the night view of Mt Fuji with factories in front is actually really beautiful. The industrial area is brightly lit up and full of colour, while the mountain sits dark and serene behind. Unfortunately there was some cloud when I went but I hope this photo gives you an idea of what it could look like! 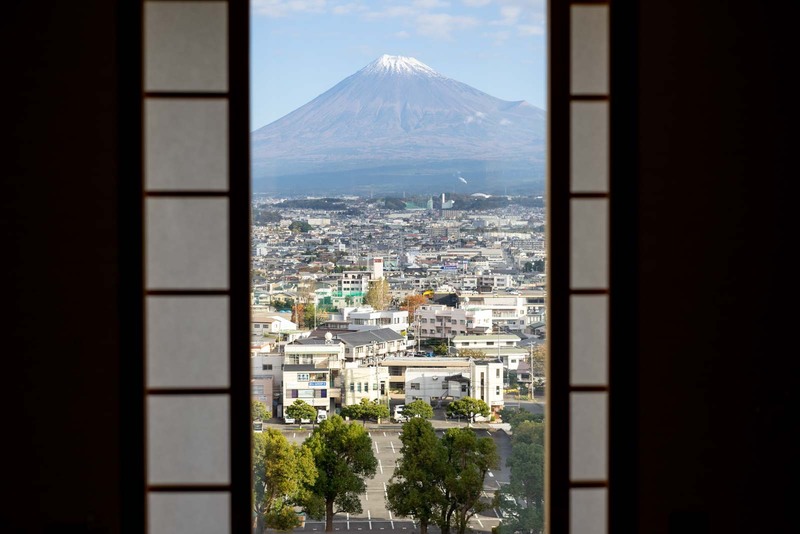 It doesn’t matter where you go – or when you go – Mt Fuji always looms large here. The factory view is just one of the things that is a bit of a local secret but a wonderful experience. You’ll definitely get a lot more out of exploring Fuji and Fujinomiya if you have a local with you. If you’re interested, I would recommend this interesting ecotour. Time Travel Turtle was supported by Fujinomiya City and Fuji City but the opinions, over-written descriptions and bad jokes are his own. Tsuke-Napori is so tasty! If you love noodles you cant go wrong with this one. Very informative guide! Thanks for sharing this, I will definitely gonna use your tips on my travel to Japan! I like Bungee jumping and Noodles.